Find out some of the most popular and lucrative courses to pursue after Class 12th in India. We often hear our parents say, “Focus on your board exams and everything in life will be easy to achieve.” Not true. It is after this that the real struggle begins. Students go through a tough phase of arriving at a decision about what they want to do in life, what course they should take up and are constantly influenced by people around them. They do what they are told or what everyone else is doing. However, it is important to critically analyse their interests and the options available to them when choosing courses after 12th. B.Tech in Mechanical Engineering/Electronics and Communication Engineering/Computer Science Engineering etc. are a favourite amongst many science students because of the challenging career opportunities it offers and the intellectual development and professionalism linked with it. 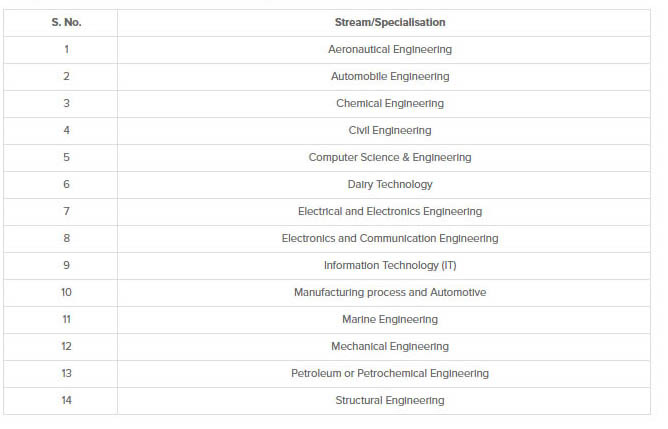 Pursuing Engineering after 12th is considered highly prestigious and is meant for those who are creative and open to discoveries. A career in engineering gives you the flexibility and a wide variety of choices for expansion. Some top engineering colleges in India are the Indian Institutes of Technology – located in India, Birla Institute of Technology and Science, ISM – Dhanbad etc. Bachelor of Surgery (MBBS) & Bachelor of Dental Surgery (BDS) is gaining importance because people are becoming aware of general health as a result of the implications of a modern lifestyle and improper care leading to a number of problems. MBBS and BDS require one to have a cool temperament, concentration and accuracy with a scientific bent of mind. Top MBBS & BDS colleges in India include AIIMS Delhi, Christian Medical College Vellore, Armed Forces Medical College Pune (AFMC Pune), Maulana Azad Institute of Dental Sciences Delhi, SRM Dental College Chennai, Dr R. Ahmed Dental College and Hospital Kolkata. Bachelor of Finance courses has gained momentum in the recent past. Those of you with a Commerce background, with a knack for numbers, this is the perfect course to opt for. This is a professional field of study, which will only gear students into becoming a long-term financial planning expert, cost control expert and sound investing expert. Typical college courses include accounting, statistics, financial markets, international finance and financial statement analysis. The best part of this course is that you can choose to pursue a Bachelor of Arts or a Bachelor of Science degree. The former will allow a more broad approach while the latter will be rigorous. With a Bachelor of Finance degree, a student can land himself/herself, a job with securities and commodities brokers, banks, insurance carriers, government agencies, real estate companies etc. Bachelor of Journalism and Mass Communication is in huge demand and is a very popular because it makes students industry-ready to inform and enlighten the people about the happenings around them. Media is one of the most powerful tools to educate people and bring about a behavioural change to promote the development of a country. A career in this field offers ample job opportunities and growth. If communicating effectively is one of your strengths, you can surely opt for this course. Specialisations include Anchoring, Journalist, Director, RJ, Photojournalist and many others. Popular Institutes that provide these courses are Indian Institute of Mass Communication Delhi (IIMC Delhi), Xavier’s Institute of Communication Mumbai (XIC Mumbai), Symbiosis Institute of Mass Communication Pune (SIMC Pune) and AJ Kidwai MCRC Jamia Milia Islamia Delhi (JMI Delhi). Hotel Management courses are gaining importance because of the rapid growth in the hospitality industry. Hotel Management also includes other associated service industries such as airline or event catering services, tour guides, Interpreters, Hospitality Promotion and Sales etc. Students willing to work in a challenging environment with long hours should opt for it. A pleasing personality to go along with it; should help you soar heights of success in the hotel management and hospitality sector. You may choose to specialise in specific areas at your PG levels like Catering, Production, Chef and Sommelier. Hotel Management makes an individual a better manager, and that can be of value across functions and industries. As such, you may not be limited to the hotel industry sector. Government Institutes of Hotel Management in India include Institute of Hotel Management located in Bangalore, Chennai, New Delhi, Goa, Hyderabad, Kolkata & Mumbai etc. Other hotel management institutes in India include Ecole Hoteliere Lavasa Pune, Christ College Bangalore, Oberoi Centre of Learning & Development Delhi. Fashion Designing is one of the non-glamorous careers (yes, that’s true) yet most appealing options for today’s students! Fashion designing is all about hard work, networking and marketing your products. On a creative level, Fashion Designing has a lot to offer. New ideas in fashion designing go a long way. If you have an eye for detail and are driven by originality, you can surely think of taking it as a career option. Some of the institutes that can help you in this vision are National Institute of Fashion Technology (NIFT), National Institute of Design Chennai, Pearl Academy etc. Bachelor of Law or B.A LL.B is a popular career choice because of the wide variety of options it provides. It includes sectors like corporate management, administrative services and legal services apart from dealing in civil and criminal laws which have been practised over the years. This field requires you to be focused, patient and logical in your approach. Faculty of Law-University of Delhi, National Law School of India University, Bangalore, Government Law College- Mumbai, NALSAR University of Law- Hyderabad, Symbiosis Society’s Law College Pune, Faculty of Law – Aligarh Muslim University are some the prestigious law institutes in India. Biotechnology is an interdisciplinary branch of Science that caters to different sectors such as pharmaceuticals, environmental conservation, agriculture, food and beverage etc. This is the primary reason why students are willing to explore this field as it gives them exposure to a wide variety of fields and there are ample opportunities available to them. It requires a high degree of scientific aptitude and intelligence. Some well-known colleges are Thapar University Patiala Punjab, School of Life Sciences- Hyderabad, Rajiv Gandhi Center for Biotechnology- Trivandrum, Department of Microbiology and Biotechnology, Gujarat University etc. Bachelor of Commerce, Bachelor of Business Administration and Chartered Accountancy courses are the most popular commerce and accounting in our country. If you have strong mathematical, analytical and statistical skills, this may be a good field for you to explore. Commerce graduates may branch out to Economics, Risk Investment, Financial Advisor, Actuary & Insurance, Company Secretary, Computer Application & Informatics and others. Strong business acumen is a prerequisite for this type of a career. ICAI and universities across India offer these courses. Some popular banking colleges include National Institute of Bank Management, Indian Institute of Banking & Finance, Sri Ram College of Commerce, Hansraj College, Lady Sriram College, Christ College and Loyola College etc. Nutrition and Dietetics is a field of science that prepares you to design controlled diets. People nowadays are getting conscious of their health which is a result of their eating habits. They seek guidance and professional help to make amendments in their lifestyle through eating patterns. Few of the renowned institutes that offer this course are Lady Irwin College- Delhi, SNDT College- Mumbai and Mangalore University. Bachelor of Elementary Education is considered one of the most suitable jobs for women in our country because of its limited working hours. However, it is a challenging field and requires one to have a passion for exchanging ideas and information with each other. Education is a key to development and hence opportunities available are many. All major universities have provisions for this course and are highly acclaimed. Whatever career you opt for, make sure that it brings you happiness and fulfils your passionate interests. You must take into consideration the available horizons post the completion of the course and only then make a decision. It is also wise to take up advice from experts in the fields and know about the actual scenario in the related industry.